Ever since Jonathan Volk launched his Facebook Ads Guide, I’ve been getting emails from readers asking for a review. I have gone through everything in the guide plus all the bonus materials and I have to say it’s one of the best guides on Facebook advertising that I have come across. Then again, this really should not be surprising. After all, Jonathan Volk is one of the biggest Facebook affiliate marketers in the business. In the past ten months, he has average nearly $4,000 per day of income from Facebook. The guide itself is not a long read. You should be able to get through it in an hour or so. There is no fluff at all. Just straight to the point facts and ready to use tips. The section on “Upper Hand Techniques” is where the real gold is. Here, Jonathan details the techniques he uses create over 1,000 facebook ads in five minutes and generate thousands of dollars in Facebook income everyday. Upper Hand Technique 4: Ask! There is an email at Facebook setup specifically for advertisers like us. This email is affiliates@facebook.com. Facebook Ads Guide Newsletter – Occationally you will receive a newsletter with all the TOP offers that you can run on Facebook with tips and tricks on HOW you can run the offers. Keyword Targeting List – SPECIAL facebook keyword list formulated to help you target SPECIFIC people groups that you normally cannot target! In addition to the free bonuses listed above, Jonathan is making available his Facebook Affiliate Mastermind video for only $37. During the last Ad:Tech in San Francisco, Jonathan gave an exclusive Facebook seminar to 20 people who paid $350 each to attend. Jonathan plans to sell that video in DVD format for $197 but you can get it as part of the Facebook Ads Guide for only $37. I highly recommend you check the video option box at check out. The video is filled with tons of top secret Techniques, like how to use a Facebook App as a landing page to increase conversions by 20% or more. 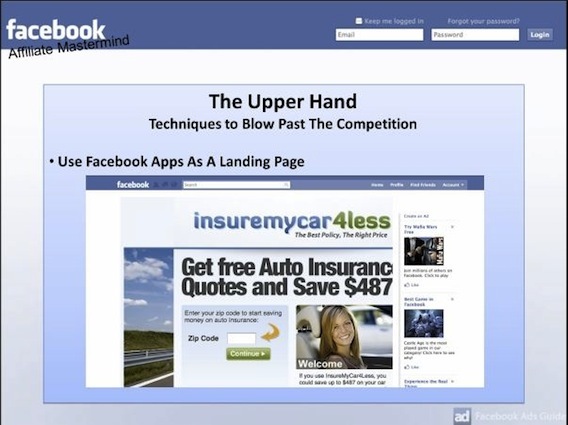 Facebook Ads Guide is on sale right now for $79. However, the sales ends this Thursday and the price will go up to $97, which is still a good deal but if you can save 20% right now, you should take advantage of it.